The t20 vapor xt is undoubtedly the flagship of the our tent range. It is essentially the t20 hyper xt with a Cuben flysheet. Cuben is a fabric that was developed for use in spinnakers for America Cup yacht racing. It has a patented construction which defies description, but it could be crudely described as dispersed dyneema yarn laminated/sandwiched into a monolithic (solid) subtrate. This substrate can be either nylon, polyester or other plastic polymers. 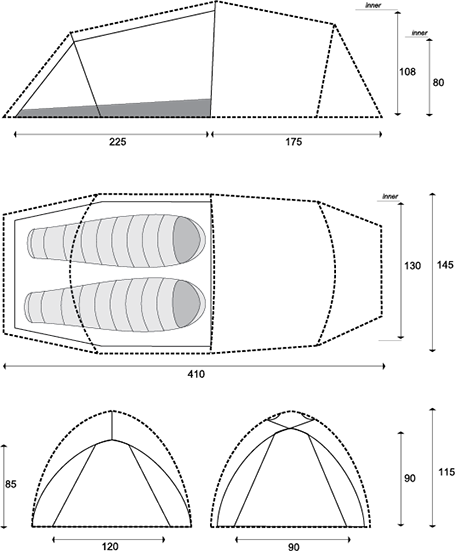 The end result is a spacious tent, with a huge porch, weighing in comfortably under 2 kg. Not only is it unbelievably light, but it is both strong and incredibly durable. Dyneema is a high-density polyethylene and is stronger than steel or Kevlar (on a weight for weight basis). It is also completely resistant to ultra-violet light, which means it will outlast any other flysheet made from either nylon or polyester. Like all Lightwave tents, the t20 vapor xt will stand up to the most atrocious conditions - we classify it as a 5 season tent. It is well featured, with three venturi-style vents and two doors with #5 YKK zips in the porch. The poles are colour coded and there are 10 guypoints. The inner tent has a bathtub construction and there is a small mesh window in the door. Available accessories include a seperate footprint for the inner tent, and a groundsheet for the extended porch. 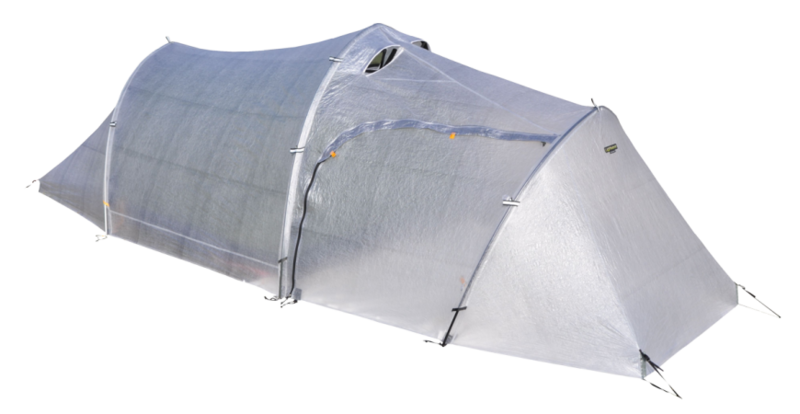 The vapor flysheet is made from Cuben, a non-woven fabric originally developed as a spinnaker cloth in the America cup. It is extremely lightweight, exceptionally strong, and completely UV-stable. The only downside is the cost! Compared with the 30 denier high-tenacity nylon used in our hyper tents, Cuben is a third of the weight and has twice the tear strength. The vapor groundsheet is made from a 40-denier nylon ripstop with a laminated thermo-plastic polyurethane (TPU) coating. TPU coatings have greater bonding durability (to the substrate fabric) and better abrasion resistance than conventional liquid-applied PU coatings. This is a much tougher fabric than it looks. This fabric is the same as that used in our hyper range. The t20 vapor xt has three 9.70 mm DAC Featherlight NCL poles. These lightweight poles have good stiffness due to the large diameter, and the DAC alloy has an excellent ability to absorb energy making the poles very resilient. Pegs are a vital component of every tent. Tunnel tents are of course completely dependent upon solid anchors at front and rear, but a self-supporting geodesic, too, needs to be prevented from blowing away in the breeze. Lightwave offers a range of different pegs with the t20 vapor xt to ensure it can be secured in all ground conditions. The t20 vapor xt comes with our Lightning guylines, a 1.50 mm blend of Dyneema and polyester with a breaking strain of 110 kg. Phenomenally light, they also absorb no water so won’t freeze up in winter. The Linelok adjusters mean they are easy to tension, even with gloves on. The t20 vapor xt is multi-pitch. This means it can be pitched flysheet first, inner-tent first, or integrally with the flysheet and inner tent attached together.